The resolver is a highly accurate and highly dependable device for absolute position shaft encoding. Resolvers have a reliable track record of applications in aerospace, military, and industry, where they have been used for decades for position sensing. Some of the common applications are radar antenna position sensing, missile guidance systems, NC machine position feedback, automotive stamping presses, 2-piece-can manufacturing presses and packaging machines. 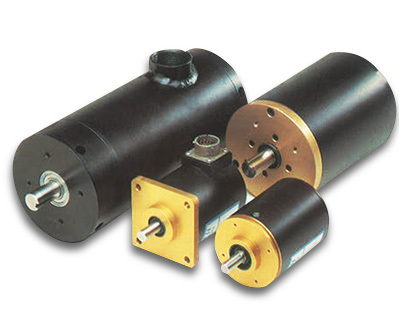 Unlike incremental encoders, the resolver is designed to operate reliably under extremely hostile environments such as continuous mechanical shock, vibration, extreme temperature and humidity changes, oil mist, coolants and solvents. The resolver is a passive transducer. It is a brushless rotary transformer with one rotor and two stator windings. The stator windings are electrically 90º out-of-phase with each other. 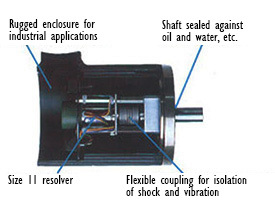 As the shaft rotates, the relative position of the rotor and the stator windings change. Either the rotor or the two stator windings together can be used as the primary of the rotary transformer and the secondary will then produce and analog-voltage corresponding to the shaft position. AVG Automation's model RL100 resolver is the most rugged resolver in the industry today. AVG Automation has over 25,000 of these resolvers operating with extreme reliability in highly demanding applications in automotive, can-manufacturing and packaging industries. Rugged, industrial housing, heavy-duty, double row, ball bearing and an internal flexible coupling lend to an extremely reliable design. AVG Automation’s E8R series is an ATEX certified Explosion Proof resolver that meets the requirements per Class 1, Div.1 Groups B, C, and D with appropriate Autotech PLS. Autotech’s SAS-RL100 resolver is NEMA 6P compliant for operation in submersible depths of up to 100 feet. It is chemically resistant to a wide variety of solvents, hydrocarbons, water, and sea water. The housing and all fasteners are 316 stainless steel. 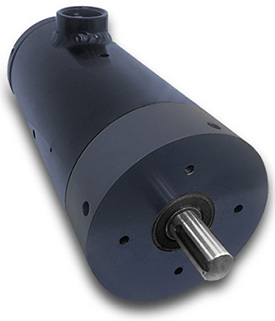 Various resolver models from AVG Automation are available with a built-in precision gear train. The resolver makes one turn for many turns of the input shaft. A multi-turn resolver consists of two resolvers coupled to each other through a gear train. One of the resolvers, called the fine resolver, is coupled to the machine shaft in such a way that it turns at the same rpm as the machine, while the other resolver, called the coarse resolver, is geared down by the gear ratio used. As the shaft of the multi-turn resolver turns with the machine movement, the coarse resolver keeps track of the number of revolutions and the fine resolver keeps track of the shaft position in each revolution. Thus, the combination of the two resolver-signals gives the absolute machine position. The gear train uses an antibacklash gear to eliminate backlash errors. For more detailed Mounting, Electrical, and Environmental Specifications, review the Resolver Manual.